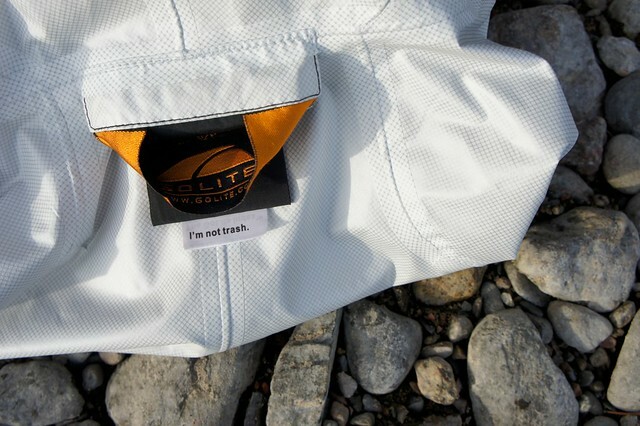 What is soft, breathable, and waterproof? 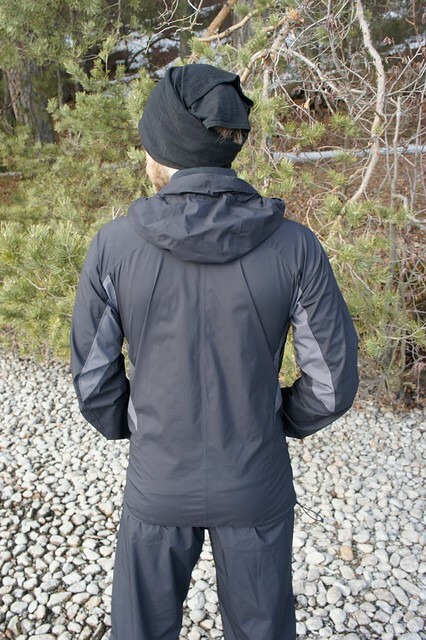 It's the GoLite Tumalo Storm Jacket and Pants, which I have been testing since last summer. In black. Because I don't (yet) do colours. Staring off contemplatively into the middle distance, as Fraser puts it. GoLite Tumalo Storm Jacket, Size S, weight 258 g.
GoLite Tumalo Storm Pants, Size S, weight 195 g.
Made of Pertex Shield. Which is soft to the touch, breathes amazingly well, and keeps the water out. 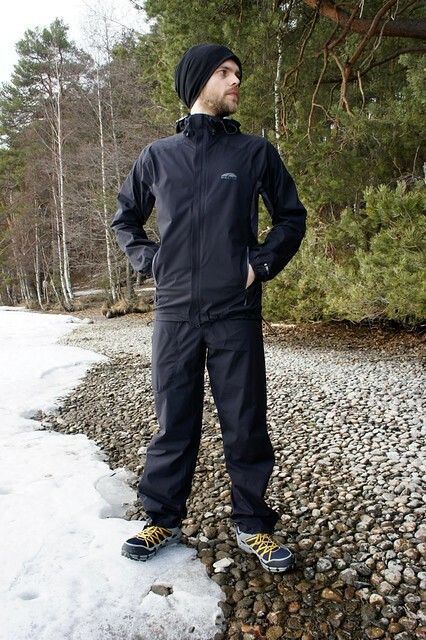 Is it better than eVent and GoreTex Paclite? In breathability terms, yes. I also haven't yet get wet in them, which means they are at least waterproof enough for my needs, which includes packrafting and canoeing in them, weathering a Finnish rain shower in the summer, autumn drizzle, and trail running in the winter. Actually I think the material breathes too well. That might sound odd for those who regularly have problems of running wet in their jackets and pants, so let me explain. Fact of the matter is, I often just wear my waterproofs when I go hiking when the weather forecast promises drizzle, rain, grey, dull wetness. No sense in putting them in the pack and wear a pants and windjacket when I will need to change it either way soon again. The pants have been the Rab Drillium pants, and I tried and switched between different jackets. In these pants & jacket, it was always comfy warm without being too clamy or wet. 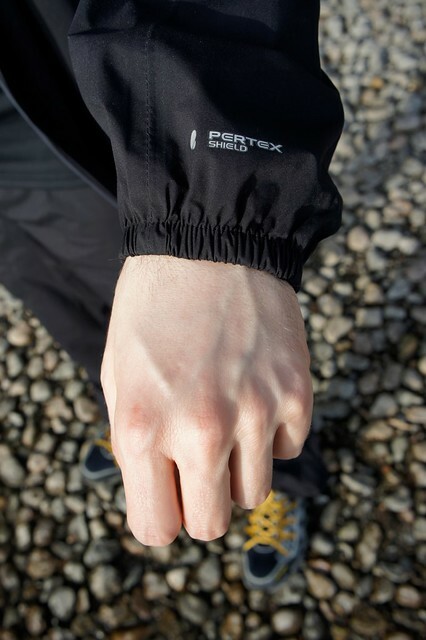 Now Pertex Shield also lets my heat escape pretty well, up to the point that if I rest for a minute to check the map and take a bearing I'm getting a bit cold. This might be merely a subjective feeling, while others might actually find it an advantage, but it is something I noticed over the months. 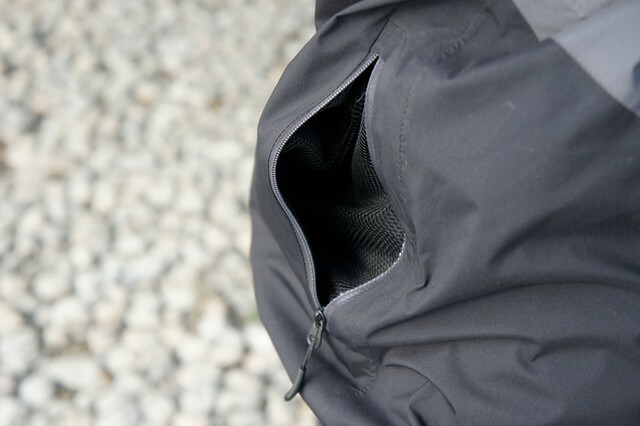 Pit zips for even more ventilation. 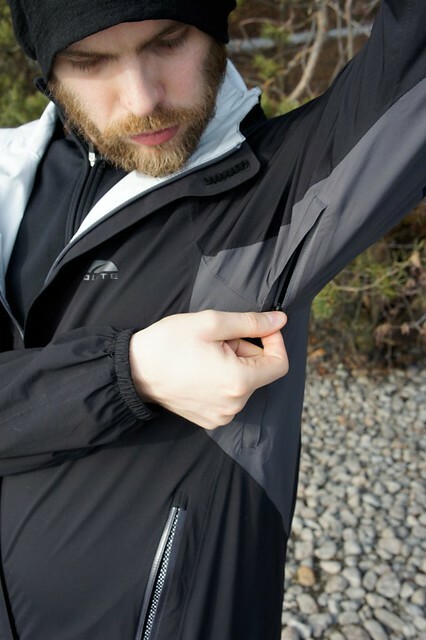 The jacket has pit zips and mesh-lined pockets which mean you can go all out and be so airy that you will fly away with the next breeze =) I haven't used the Pit Zips a lot, as it is seldom hot and humid in Finland, but those in Southern Europe, Asia and Southern America will likely welcome this breathability. The Waterproofness is, as said, excellent. The cut is spot on for me, a nice long back and sleeves which end in elastic cuffs (sadly no thumbloops), with a shock cord closure on the bottom hem and a two-way zipper which has a storm flap. Now two-way zippers and me have a interesting relationship, as we don't often seem to work smoothly together. However, this zipper is a tad easier than other jackets with two-way zippers which I have used, though I believe that a simple zipper still is best. To round things out, all seams are taped. Sweet! 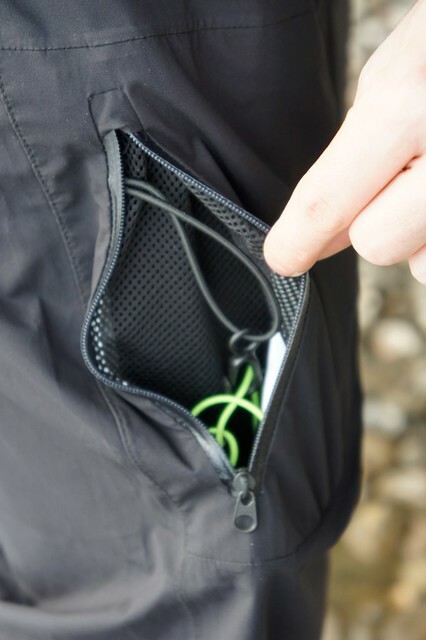 Mesh pockets to store stuff and ventilate. 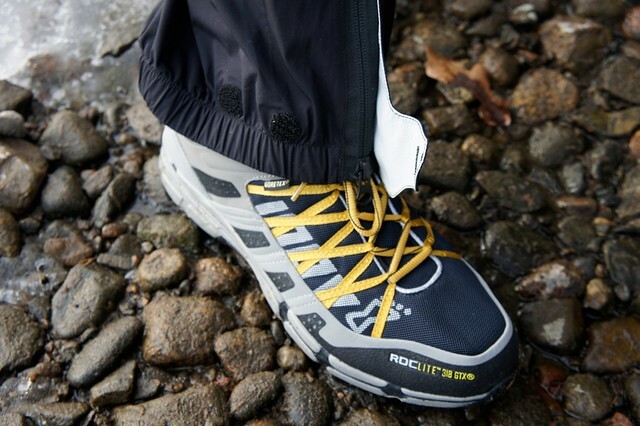 The waterproof pockets are good, though it is easy for stuff to entangle itself in the mesh. You also can use the pockets double, as in that when you open the jacket you can put something, like a map, behind the pocket. See the above photo to understand what I mean. Which brings us to the hood. It is a hood, which could have been made better. Of course my bar is high with the Haglöfs OZO hood as the benchmark, but even in comparison with the Arc'teryx Squamish Hoody I found the hood lacking - it is a tad fiddly, and doesn't cover my head too well. My solution to this problem is to use the Tumalo Jacket with an umbrella for best wet weather protection while keeping the best visibility. If you don't carry an umbrella, and have a smaller head than me, then you might find the hood just fine. Long back, and a hood. On to the pants then. 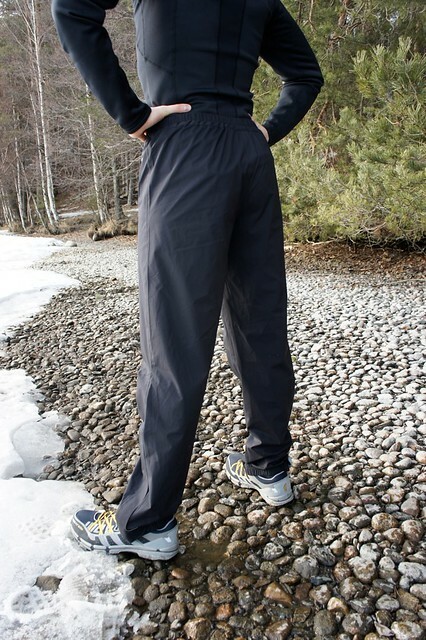 Again they have fully taped seams, an elasticized waist with draw cord, a small cargo pocket with a keychain hook, short calf zips with a storm flap and velcro closure. Same very breathable, black, soft Pertex Shield material, so what I said for breathability and waterproofness also applies here. Good long cut, comfy on the hips, free to move and scramble up hills, and rather durable as well. Zipper and velcro at the leg. Leg pocket with a key hook and enough place to keep your phone and wallet. They have been very nice to use through the last three seasons, being much better than I expected - coming from 3 layer garments, I thought these can't be nearly as good, but my belief was quickly disabused after using them. If you are disappointed with the performance of other "highly breathable & waterproof" garments and are thinking about trying something new, then this jacket and pants might be well worth a look. In case you find black boring (w00t?!) then the jacket is also available in Rust Red and Blue. You can get your GoLite Tumalo Storm Jacket and GoLite Tumalo Storm Pants now at Ultralight Outdoor Gear where they're available at a nice discount!